Well, had a crafting accident today...bummed. On the upside of things I have 4 penpals to reply to so now I have the time. I did get the project finished but it was the only thing I have finished today. I was using UTEE and embossing ink alternately on a pumpkin diecut using tweezers. All was going well, right up until it fell from the fine point tweezers and onto my hand while still in the flux state. Blisters, yup. Not to mention having to peel the embossing powder off my skin. So I have poured some lavender essential oil on the burns and my hand is sitting on an ice pack while I type one-handed. 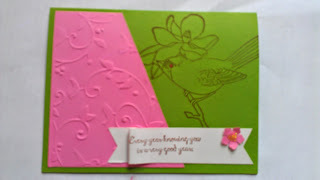 I was going to type then post a tutorial... but here is the card I made for it. Tutorial may need to wait a bit.